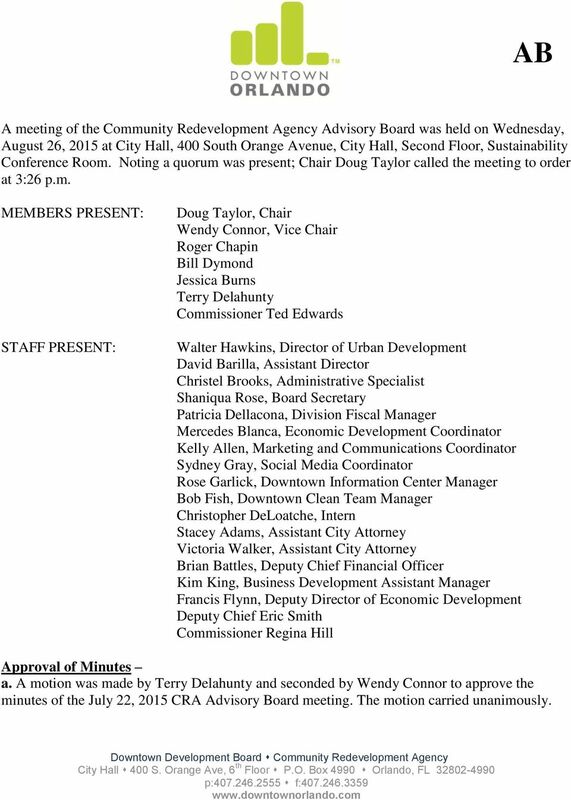 Download "Wendy Connor, Vice Chair Roger Chapin Bill Dymond Jessica Burns Terry Delahunty Commissioner Ted Edwards"
1 AB A meeting of the Community Redevelopment Agency Advisory Board was held on Wednesday, August 26, 2015 at City Hall, 400 South Orange Avenue, City Hall, Second Floor, Sustainability Conference Room. Noting a quorum was present; Chair Doug Taylor called the meeting to order at 3:26 p.m. MEMBERS PRESENT: STAFF PRESENT: Doug Taylor, Chair Wendy Connor, Vice Chair Roger Chapin Bill Dymond Jessica Burns Terry Delahunty Commissioner Ted Edwards Walter Hawkins, Director of Urban Development David Barilla, Assistant Director Christel Brooks, Administrative Specialist Shaniqua Rose, Board Secretary Patricia Dellacona, Division Fiscal Manager Mercedes Blanca, Economic Development Coordinator Kelly Allen, Marketing and Communications Coordinator Sydney Gray, Social Media Coordinator Rose Garlick, Downtown Information Center Manager Bob Fish, Downtown Clean Team Manager Christopher DeLoatche, Intern Stacey Adams, Assistant City Attorney Victoria Walker, Assistant City Attorney Brian Battles, Deputy Chief Financial Officer Kim King, Business Development Assistant Manager Francis Flynn, Deputy Director of Economic Development Deputy Chief Eric Smith Commissioner Regina Hill Approval of Minutes a. A motion was made by Terry Delahunty and seconded by Wendy Connor to approve the minutes of the July 22, 2015 CRA Advisory Board meeting. The motion carried unanimously. 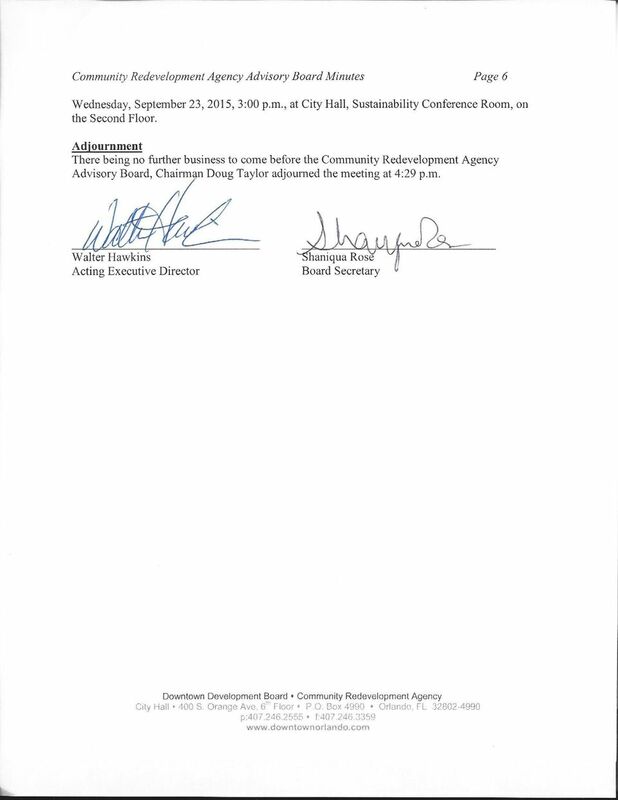 3 Community Redevelopment Agency Advisory Board Minutes Page 3 for the Chair and Executive Director to execute the Agreement, subject to review and approval by the City Attorney s Office. 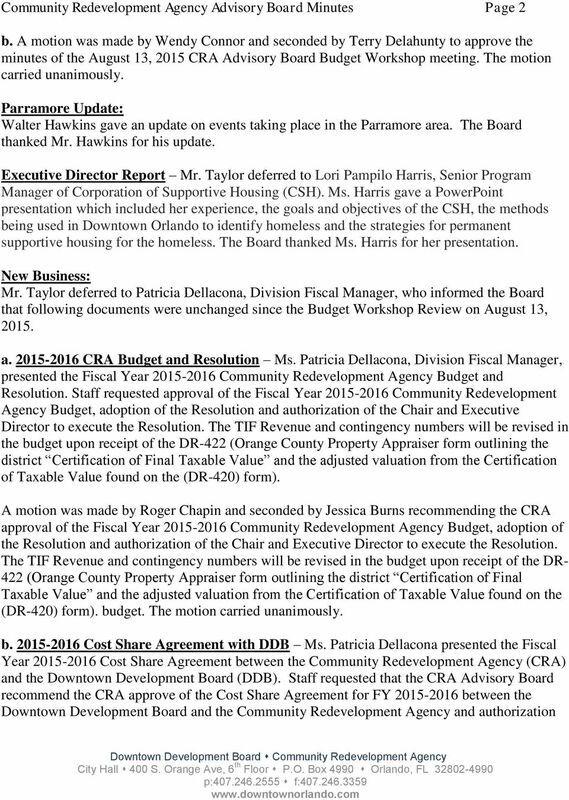 A motion was made by Wendy Connor and seconded by Bill Dymond recommending the CRA approve the Fiscal Year Cost Share Agreement with the DDB and authorization for the Chair and Executive Director to execute the Agreement, subject to review and approval by the City Attorney s Office. The motion carried unanimously. c City Services Agreement Ms. Patricia Dellacona presented the Fiscal Year City Services Agreement to the Board. Ms. Dellacona reminded the Board that the City Services Agreement outlines the terms under which the City will provide administrative and professional support to the CRA in its implementation of the Community Redevelopment Plan. 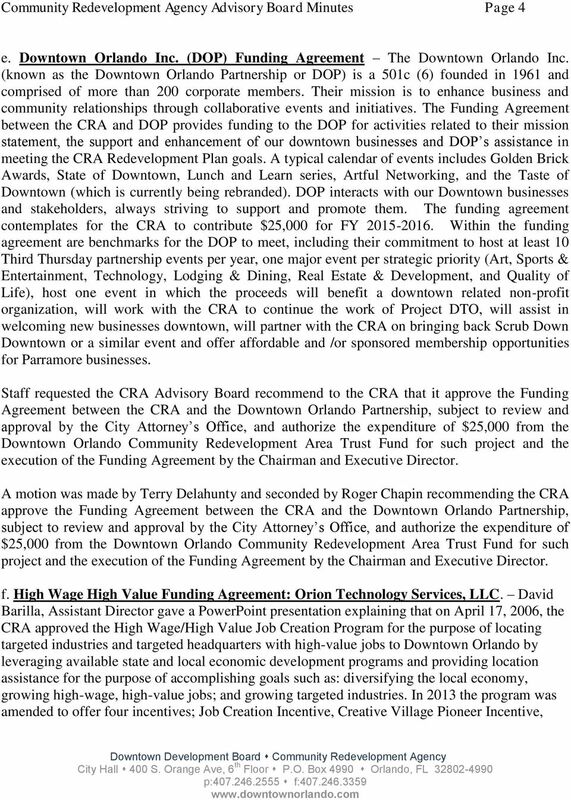 Staff requested the CRA Advisory Board recommend the CRA approve the City Services Agreement for FY between the City of Orlando and the Community Redevelopment Agency and authorization for the Chair and Executive Director to execute the Agreement, subject to review and approval by the City Attorney s Office. 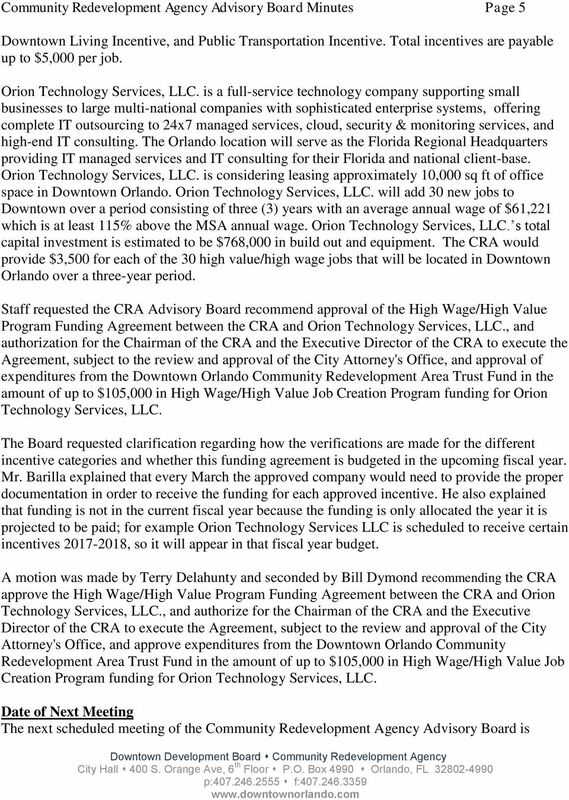 A motion was made by Terry Delahunty and seconded by Roger Chapin recommending the CRA approve the Fiscal Year City Services Agreement between the CRA and the City of Orlando and authorize the Chair and Executive Director to execute the Agreement, subject to review and approval by the City Attorney s Office. The motion carried unanimously. d. Seniors First Agreement Ms. Patricia Dellacona presented the Seniors First Agreement Renewal to the Board. Ms. Dellacona reminded the Board that the annual agreement between Seniors First, Inc. and the Community Redevelopment Agency (CRA) to provide a senior transportation service (Senior Tran) to residents of 11 downtown senior housing complexes expires on September 30, Funding levels for this agreement are the same as the funding level for fiscal year Staff sought recommendation for the CRA to approve the renewal of the Seniors First Agreement for a period of October 1, 2015 to September 30, 2015 for up to a total amount of $46, and authorization of expenditures from the Downtown Orlando Community Redevelopment Area Trust Fund of up to $46, for such project, subject to review and approval by the City Attorney s Office, and authorize execution of the Agreement by the Chairman and Executive Director. 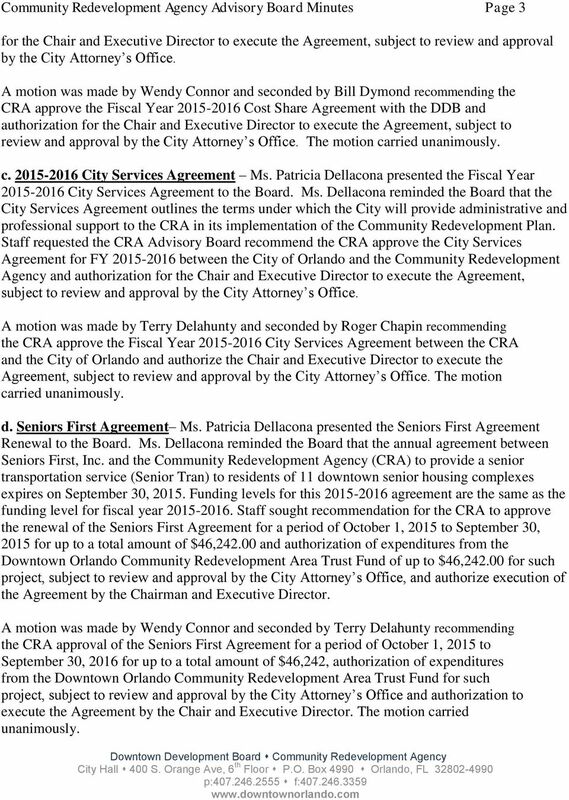 A motion was made by Wendy Connor and seconded by Terry Delahunty recommending the CRA approval of the Seniors First Agreement for a period of October 1, 2015 to September 30, 2016 for up to a total amount of $46,242, authorization of expenditures from the Downtown Orlando Community Redevelopment Area Trust Fund for such project, subject to review and approval by the City Attorney s Office and authorization to execute the Agreement by the Chair and Executive Director. The motion carried unanimously. BREVARD COMMUNITY COLLEGE BOARD OF TRUSTEES MEETING Board Room (#231) 4:35 p.m. Administration Building (Bldg. #2) Cocoa Campus PRESENT: ABSENT: Mr. C. R. Rick McCotter III, Vice Chairman; Mr. James W.
Call to Order, Roll Call Certification of Quorum BOARD MEETING TEXAS STATE AFFORDABLE HOUSING CORPORATION Held at the offices of Texas State Affordable Housing Corporation 2200 E. Martin Luther King Jr.
WEST VILLAGES IMPROVEMENT DISTRICT CITY OF NORTH PORT SARASOTA COUNTY REGULAR BOARD MEETING JANUARY 27, 2015 11:00 A.M.
July 13, 1999. Commissioner Johnson out at 9:10 and returned at 9:11 a.m.
Kristen Roberts gave a brief summary of the items listed on the regular agenda. Chairman McKay adjourned the pre meeting at 6:19 p.m.
Subcommittee Chair, Rodney Rawls, called the meeting to order, asked for a roll call and declared the presence of a quorum. MEMORANDUM. Recommendation: Recommend that the full Board adopt changes to the Board Performance Review Policy. OFFICIAL MEETING MINUTES OF THE BIOSCIENCE LAND PROTECTION BIOSCIENCE & TECHNOLOGY COMPLEX PALM BEACH COUNTY, FLORIDA JANUARY 19, 2012 THURSDAY PALM BEACH STATE COLLEGE 1:40 P.M. PALM BEACH GARDENS 1. Join us for a day and a half event featuring Dallas area consultants and professionals in the site location field. August 19, 2008 Statesboro, GA Regular Meeting The Board of Commissioners met at 8:30 a.m. in the Community Room of the North Main Annex. Chairman Nevil welcomed guests and called the meeting to order. REGULAR MEETING AGENDA 125 E. College Street, Covina, California Council Chamber of City Hall Tuesday, June 16, 2015 6:30 p.m.
VIRGINIA: At a Business Meeting of the Board of Supervisors of the County of Patrick, held at the Patrick County Veteran s Memorial Building on Monday, December 08, 2014 at 6:00 p.m. PRESENT: Crystal P.
Georgia Regional Transportation Authority 245 Peachtree Center Avenue, NE, Suite 400 Atlanta, Georgia GRTA/GDC Board of Directors. CONNECTICUT LOTTERY CORPORATION. Minutes of the Board Meeting held on Thursday, September 18, 2014 At 12:00 p.m. Supervisor Carges called the meeting to order at 7:00 p.m. and asked everyone present to say the Pledge to the Flag. The meeting was called to order by Ms. Peluso at 4:05 p.m. in the Board Room, A300. Regular Meeting of the Lakewood City Council called to order at 7:33 PM by Acting President Madigan. Conducting an Effective Neighborhood Association Meeting Adapted from City of Arlington, Texas Making Your Meetings the Best Select a neutral place to meet. Plan your meeting. Always start and end on time. OHIO VALLEY REGIONAL DEVELOPMENT COMMISSION Executive Committee Meeting Minutes Chairman: Bob Proud Interim Vice-Chairman: Roger Rhonemus Pike Government Center Treasurer: Doug Corcoran Waverly, Ohio 1. The Five Year Financial Plan is a forecast of revenues and expenditures that begins with the adopted annual budget for the upcoming fiscal year (FY16) and continues for four additional years (through FY20). to conduct a review of the jobs reporting verification process employed by WEDC.